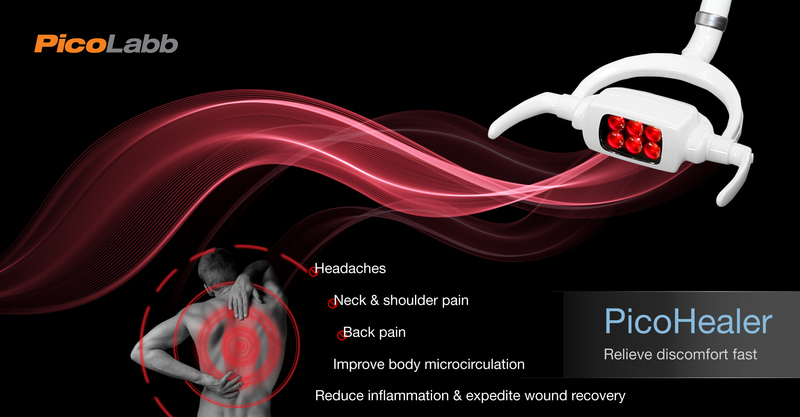 PicoHealer is a light delivered healthcare device that quickly relieve a variety of pains and discomfort. With the floor standing suspension design, the protonic light of PicoHealer can penetrate effectively into the acupoints and tissues through normal clothing, skin and the hair covered areas. PicoHealer has unique advantages and it is applicable for all areas including infected areas, wounds and hair covered areas. The effectiveness of pain relief is enhanced with an unique flashing mode in PicoHealer. Point the contactless protonic light at the corresponding acupoints to enhance the Qi (i.e. energy of life in Chinese medicine) in the body. Poor microcirculation manifest into pain or illnesses. PicoHealer with Pico Technology improves body fluids and tissue cells to result in faster and stronger microcirculation that maximizes body’s own healing potential, and ultimately restore health. Inflammation is a self-protection mechanism, which is the body's immune response to reduce the stimulation of harmful substances for body recovery and health. PicoHealer promotes blood and lymphatic circulation in the body, repairs soft tissue, reduces inflammation, accelerates wound recovery and pain relief. Many people are annoyed while suffering from various kinds of pain such as headaches, neck and shoulder pain, back pain, sciatica and joint pain. The blocked meridian flow or impeded microcirculation will manifest as pain or an illness as explained in the theory of Traditional Chinese Medicine. Point PicoHealer at the area of pain can instantly improve the microcirculation, quickly re-establish the meridian flow and relieve pain in a short time or even minutes. Environmental pollution and stress in life often trigger immune system overreaction leading to allergic rhinitis, eczema, psoriasis and subsequent infections. PicoHealer enhances the body immunity and metabolism, encourages rapid recovery of wounds and infections. Most skincare products or ointments remain on the skin surface, but not fully absorbed. The protonic light of PicoHealer enables the topical applications to be absorbed into the skin quickly and deeply, making them more effective. PicoHealer allows the free rotation at any angle to fit your need. In addition to our standard model, customer can order the following three professional models according to individual needs and health condition. PicoHealer is also applicable for the caring of pet. The book helps the user for the best use of iWand Pro 100 to restore body health, relieve pain and prevent illness. The book helps the user to apply iWand Pro 100 on dogs and cats to relieve pain and prevent illness. PicoHealer is enabled by Pico Technology.